Here is a good news for all the Verizon customers. Verizon is giving away the 4G LTE Smartphones for free. Only term you have to follow to get the free Verizon 4G LTE smartphones is 2 years contract. 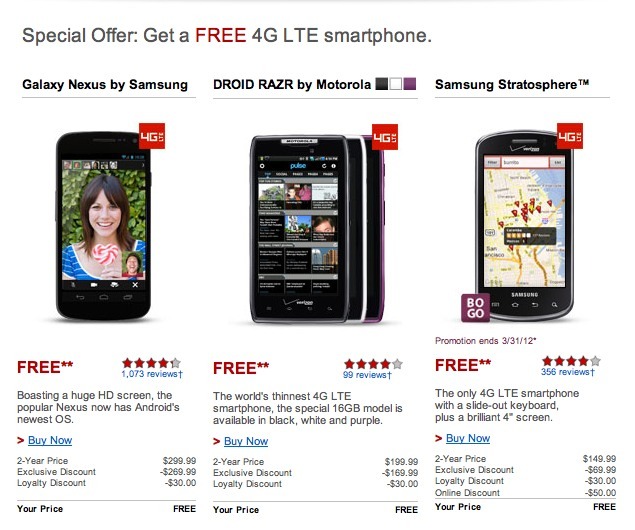 As mentioned on the Droid Life, Verizon is sending the emails regarding this to the existing customers regarding this promotion where Verizon is giving the Samsung Galaxy Nexus, Motorola DROID Razr and Samsung Stratosphere for free.